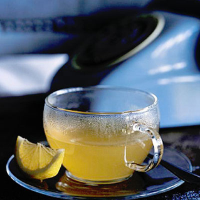 This warming citrus tea makes a great afternoon "pick me up" and it’s great for digestion too. Boil the kettle, then place the juice and zest of an unwaxed lemon and 1 tbsp grated root ginger in a heatproof jug, add 500ml boiling water and 1 Lady Grey Tea Bag. Allow to infuse for 5-6 minutes, then strain and stir in 1-2 tsp Waitrose English Blossom Clear Honey to taste.